In northern Israel, the holiday of Tu B’Shevat coincides with the blossoming of almond trees. For road-trippers up here, flowering almond-tree orchards line the streets of the scenic drive heading east from Haifa to the Jezreel Valley. Reminiscent of cherry blossoms, their striking beauty reminds us that spring is on its way. Indeed, Tu B’Shevat, sometimes called the birthday of the trees and which begins the evening of January 20, is the ideal holiday to stop and admire the wondrous flora all around us—but especially in Israel—as we look ahead to warmer months. But in the meantime, it’s still cold and rainy, the perfect time of year to cozy up to a steaming cup of tea. 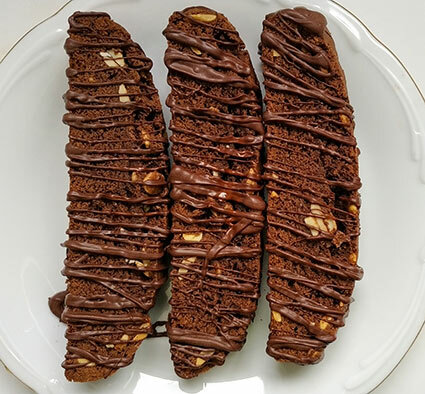 And what better cookie to dunk in your tea than an extra-large slice of Double Chocolate Almond Biscotti that comes drizzled with melted dark chocolate for extra flair. A pick-me-up that isn’t as guilt inducing as it seems, these biscotti call for almond in two ways: as an extract and as blanched, lightly toasted almond halves. The rich almond fragrance and taste help me look forward to spring while also providing a not-so-subtle nod to Jewish mandelbrot. This intersection of Tuscan and Jewish cuisine exemplifies the simple Mediterranean style of eating that I prefer. What’s more, these cookies remain fresh and shelf-stable for ages: Indeed, they originated in Roman times, when they were taken on long, arduous journeys. They are easy to whip up, with a dough that contains less fat than typical mandelbrot, making them less sticky and therefore easier to shape than their Jewish counterpart. But please, make sure not to skip the step where the almonds get toasted. It is essential for asserting the flavor of the almonds themselves, which in turn imparts a lovely significance to Tu B’Shevat, the birthday of the (almond) trees. B’teyavon, and hag sameach. Nothing dresses up a cookie quite like a drizzle of dark chocolate. Here, it is part of what makes this crunchy biscotti so desirable as well as a hint to the Dutch-processed cocoa powder featured in the dough itself. Along those same lines, almond extract is coupled with toasted blanched almond halves, the latter of which adds a toasty flavor and crunchy texture to the cookie. Toast almond halves in a dry frying pan on medium-high heat until they release an aroma and brown slightly (1-2 minutes). Immediately take off heat and set aside. In a medium bowl, whisk together the flour, cocoa powder, espresso powder, salt and baking powder. Set aside. In a mixer, beat butter and sugar until well blended. Add eggs, vanilla and almond extract and beat until pale in color, 1-2 minutes. Add the dry ingredients to the wet and mix until incorporated. Mix in the toasted almonds, then turn out the cookie dough onto a lined baking sheet. Form dough into an oval-shaped log and bake for 22-25 minutes, until visibly dry. Let cool slightly, then cut into 10 thick slices while still warm. Lay slices on their side on the same baking tray. Reduce oven temperature to 325° and toast the biscotti for an additional 25 minutes. Let cool completely on the baking tray. As cookies cook, break dark chocolate into small pieces and melt in the microwave, using 30-second intervals so as not to burn the chocolate. Stir between each pulse of heat from the microwave. 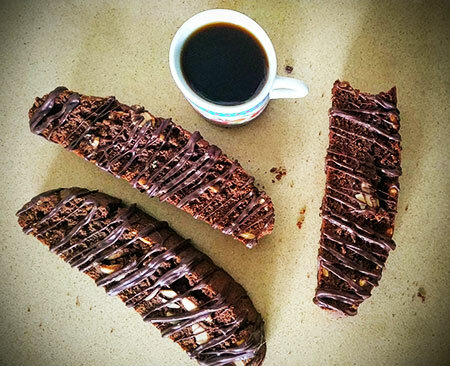 Using a fork, drizzle the chocolate along the entire length of the cooled biscotti. Let set up until firm to the touch, then store in a container with a tight-fitting lid.